Colombian President Juan Manuel Santos prepares to join FARC leader Timoleón Jiménez in signing a peace accord. Photo: State Department/Public Domain. The Colombian case, monitored by the United Nations, can be characterized as an example of the theoretical and practical field of knowledge known as “transitional justice” since the demise of the Argentine dictatorship in 1983. Although for Professor José Zalaquett it is a misnomer – as it focuses excessively on judicial arrangements and leaves aside other measures such as truth-telling, the preservation of memory and the compensation of victims – transitional justice has become a household expression to refer to situations where a society has to deal with a legacy of political violence and human rights violations, aiming at compensating victims and preventing the recurrence of new institutional breakdowns. Learning from past failed attempts at peace in the country, the final understanding between both parties is meant to be a comprehensive settlement. But the Colombian case is also special for it has endured all the stages of the brief history of transitional justice, as identified by Professor Ruti Teitel. Teitel refers to a first phase, epitomized bythe Nuremberg trials, right after the Second World War; a second phase beginning in the late 20th century with the fall of several Latin American dictatorships and the Soviet Union; and a third phase, beginning with the turn of the 21stcentury, which is currently unfolding and to which the Colombian peace agreement will contribute substantially. 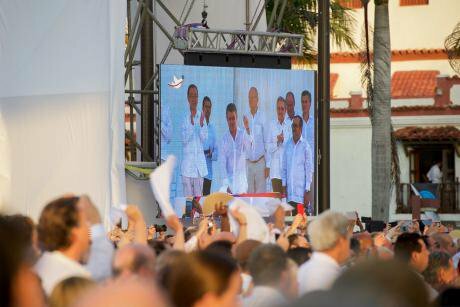 The “Final Agreement to End the Armed Conflict and Build a Stable and Lasting Peace”, the Colombian Peace Agreement, signed by the National Government and the FARC-EP, is a very comprehensive document, the result of 4 years of negotiations in neutral ground. It was drafted as 6 separate agreements, covering chapters on: (1) a comprehensive rural reform; (2) political participation; (3) the end of the conflict; (4) a solution to the illicit drugs problem; (5) victims of the conflict; and (6) the implementation, verification and endorsement process. Each of these individual agreements was negotiated separately, but under the understanding that nothing was agreed until everything was agreed. Learning from past failed attempts at peace in the country, the final understanding between both parties is meant to be a comprehensive settlement with the ability not only to put a definitive end to the armed conflict in the form of a ceasefire, but also to demobilise and demilitarise the rebel forces, to solve the political conflict, and to heal the country and its victims after half a century of an internal war. This is a very interesting and unique agreement, in the sense that the negotiators have been especially careful regarding the compliance with the highest standards that international law has set in this matter: from the substance of the provisions to the formality of depositing it in Bern as a Special Agreement pursuant to common Article 3 of the 1949 Geneva Conventions. Special attention is to be put to the Special Jurisdiction for Peace (SJP), because the carefulness with which it was drafted makes it look as if pulled out of a transitional justice handbook. Its application will test and stress the best ideas, practices and lessons provided by the special criminal tribunals established previously, in the context of other conflicts, as evidenced by the close monitoring of the Colombian situation by the Prosecutor of the International Criminal Court, Fatou Bensouda, who has saluted the Agreement as a means for the Colombian people “to reap the full dividends of peace”. The Colombian case also illustrates how it is easier for the parties to reach and honour an agreement when there is a strong central government sitting at the table. The Special Jurisdiction for Peace is the judicial component of the Comprehensive System for Truth, Justice, Reparations and Non-Recurrence (chapter 5) and, as such, it is based on the obligation of the State to address the rights of the victims.The victims’ main rights are the right to justice and the right to peace, which the State has the obligation to pursue. It is also concerned with disclosing the truth to Colombian society and offering full legal certainty to those who participated in the conflict. To that end, the SJP provides a special procedure to investigate and prosecute crimes committed in the context of the conflict, as well as to pardon – excluding amnesties for war crimes and crimes against humanity - or to apply special criminal treatment to those responsible, whether they be members of the FARC-EP or agents of the State. Notwithstanding all of the above, it would be a mistake to consider the SJP an isolated element of the peace agreement. The document agreed upon in August, and amended in November, has to be understood and assessed as a whole. Its comprehensiveness and inclusiveness produces such benefits (and sacrifices) for both parties that it increases the costs of dishonouring the agreement in such a way that it is always better to comply. We already saw this after the results of the referendum: despite the negative results, the negotiating parties saw no other option but to continue improving the terms of the agreement. The Colombian case also illustrates how it is easier for the parties to reach and honour an agreement when there is a strong central government sitting at the table – unlike the case of Somalia – and when the armed groups have enough inducements to lay down their weapons without the threat of unfettered future political and judicial persecution – unlike the case of the Argentine military in the 1980s. In short, after a successful process of laying down arms monitored by the United Nations, the Colombian peace process is one to keep an eye on, to see how this comprehensive, as well as intricate, set of commitments is able to secure peace and bring about a democratic as well as just transition towards the normalization of the country.